A New Canaan Wedding is a special event in this beautiful Connecticut town. One of the most prominent venues in the area, the Waveny House, makes a New Canaan Wedding a day that will be remembered by all who attend for years to come. The Waveny House is a Town of New Canaan municipal building and is located in the picturesque Waveny Town Park. The grand house was constructed in 1912 in the style of the Tudors for the Lewis Lapham family. The home was purchased by the town in 1967 and the grounds are now managed by the New Canaan Recreation Department. This image of a wedding at the Waveny House shows the details of a wedding that make it truly unique regardless of the venue. At the center of the picture sits the wedding cake. The layered cake is covered in vanilla frosting. At the top of each layer the icing becomes ruffled, adding design and texture to the delicious work of art. Simple flowers with bright green leaves adorn the side of the cake, and at the top sits the crowning detail. 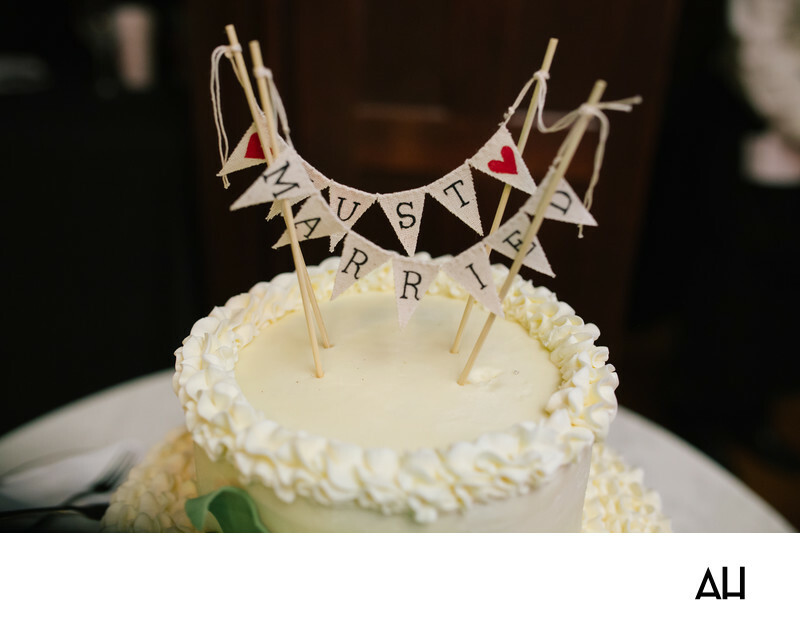 The cake topper is made up of four thin wooden sticks, with a tiny banner strung between them. The banner is comprised of small upside down triangles, with each triangle containing a letter for the phrase “Just Married”. The cake sits in wait for the moment the bride and groom cut it together, a wedding tradition that all who are present on this happy day can enjoy.